Can town librarian Lily Dixon and MMA bad boy Reese Cooper keep their love affair secret in small town Iowa? “Thanks.” Lily forced a weak smile on her face as she slipped out of her office and followed the boy between the shelves. She stopped dead in her tracks as she reached the circulation desk. She caught the gasp in her throat as he pressed tight against her, her skin able to make out the hard contours of his body. His breath was warm on her neck as he brushed a curl off her shoulder. “I know there’s something that can tickle my fancy in this aisle.” He reached over her and tugged a couple novels off the top shelf. His lips brushed the curve of her ear as his hand settled at his side still clutching the books. She shuddered at his touch. “I’ll start with these,” he breathed. “Let me go check them out for you,” she struggled. Lily rushed to the check out desk sensing Reese on her heels. Her thoughts were a scramble. Did he just kiss her ear? Did he want to kiss her? Of course he didn’t. He had to have a girlfriend wherever he used to live. Las Vegas, wasn’t it? She was probably some gorgeous show girl who could rock his world in the sack. Tricia Andersen lives in Iowa with her husband, Brian and her three children – her sons, Jake and Jon, and her daughter, Alex. She graduated from the University of Iowa with a Bachelor of Arts in English and from Kirkwood Community College with an Associate of Arts degree in Communications Media/Public Relations. 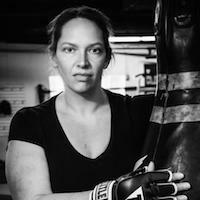 Along with writing (which she loves to do), Tricia practices mixed martial arts, coaches and participates in track and field, reads, sews and is involved in many of her children’s activities. Links to Tricia’s website, blog, books, etc. **SPECIAL GIVEAWAY**: Tricia has a giveaway for one of her Karen’s Killer Book Bench blog readers! 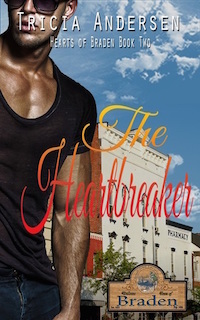 Leave a comment below for a chance to win an ebook copy of THE HEARTBREAKER by Tricia Andersen upon its release. Don’t miss the chance to read these stories! Thanks, Tricia, for sharing your story with us!! Good morning, Tricia, and welcome to Karen’s Killer Book Bench. I really do love “opposites attract” stories! And I love librarian heroines. Can’t wait to read this one. Thanks for sharing your story in the Hearts of Braden series with us! Hi, Tricia! This sounds like a great one. I would love to win. Thank you Karen, for the intro…I love conflicted romance stories and this sounds as if it fits the bill. I also like the humor implied in this excerpt because humor is a must have in my reads!